NEW YORK (CNNMoney) -- If you're one of the estimated 2.5 million iPhone customers looking to switch to Verizon next month, you're probably furiously pounding away on your calculator to see if defecting is worth the money. It can be a confusing calculation, but we've got your back! Here are all the things disgruntled AT&T iPhone customers should consider when deciding whether to cancel the service and get a Verizon iPhone. When did you buy your iPhone? This is the largest factor that will determine how much you'll pay to switch. If you're still under contract with AT&T, you're going to have to pay an early termination fee to get out of your current plan. That could be a lot or a little, depending on how old your iPhone is. If you bought your iPhone before June 2010, your early termination fee is $175 less $5 for each month that you've paid AT&T for your current contract. So if you're using an iPhone 3GS that you bought right when it went on sale, in late June 2009, you'll owe AT&T $80 to cancel. But if you bought your iPhone after June 1 (that's all of you, iPhone 4 users), your early termination fee is a whopping $325, minus $10 for each completed month. So if you bought an iPhone 4 the week it launched, you'll owe AT&T $255. Do you want to buy a new iPhone 4? Because you're going to have to. 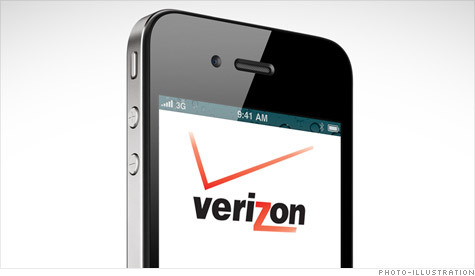 Your current iPhone won't work with Verizon's service, due to technical differences between the two networks. That means you'll have to shell out at least $200 for a new iPhone. Are you a heavy data user? Depending on how much data you download each month, you could end up spending less with Verizon (VZ, Fortune 500) -- or you could face a higher bill. AT&T (T, Fortune 500) customers pay $15 a month for 200 megabytes of data, or $25 for 2 gigabytes plus an additional $10 for each gigabyte of monthly data usage that exceeds the allotted 2 GB limit. For a limited time, Verizon will offer an unlimited data plan for $30 a month. That means customers who download 1.9 GB of data on their iPhones each month will pay $64.99 to AT&T or $69.99 to Verizon. But those who download 2.1 GB of data will pay at least $74.99 on AT&T, compared to the same $69.99 if they have Verizon's unlimited plan. What condition is your current iPhone in? Surprisingly, this could save you a lot of money. With Verizon's Trade-In Program, a 16 GB iPhone 4 in pristine condition could get you as much as $212 towards a Verizon gift card, which you can use towards your new iPhone and plan. A 32 GB iPhone 4 in excellent condition could be worth $285. That takes care of a big chunk of the cost of switching. If you have an older iPhone, you could still get a good deal. A 16 GB iPhone 3GS could get you up to $116, and a 16 GB iPhone 3G could be worth up to $60. The bottom line: It's going to cost you. If you're like most Apple (AAPL, Fortune 500) fankids, you probably bought your iPhone 4 the first week it went on sale. In that case, if your iPhone is still in good condition, it could cost you $243 to switch. The new iPhone 4 costs $200, your early termination fee would be $255 ($325, less the $70 of credit you accumulated over the past seven months), and Verizon's trade-in program offers $212 for a 16 GB iPhone in good condition. Let's say you got your iPhone 3GS in July 2009, and you can't bear the thought of sticking with AT&T for the last six months of your contract. Maybe you should wait it out. You'd be out $164 by switching to Verizon: The iPhone 4 costs $200, your early termination fee would be $80 ($175 minus the $95 of credit you've earned), and Verizon's trade-in could get you $116. If you wait that six months, you'll still have to fork over $200 for a new phone -- but by June, you'll be able to snag an iPhone 5. It all depends on just how much you hate AT&T. They're spending $50 billion. You'll be paying.